Coworking space is a boon and refreshing change for work from home professionals, freelancers and startups, but one bad apple can quickly spoil the whole barrel. In this case, what it means is that you need to follow certain clearly spelled out rules and also some unwritten ones that you can label as etiquette. What we learnt from our own experience running these coworking spaces in Bangalore is that your community of coworkers quickly learns the rules and establishes an etiquette that everyone soon starts following. 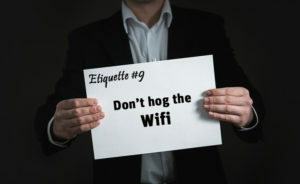 When you go to a new coworking space, you must know the rules, and quickly find out the unspelled etiquette that everyone follows. Here’s a set of top 10 tips for coworking Bangalore etiquette that we believe will be helpful for coworkers and coworking spaces all over the world. Most coworking spaces provide access to things you may need such as headphones, chargers, etc. So even if you forget to bring some of this, don’t hesitate to use whatever the facility provides. But never trouble your coworkers for this. There’s a difference between asking the facility staff and borrowing from your fellow coworkers. I’m sure the staff will be happy to help you in any way possible. Look around you for what you need – there may be a charger or headphone on your desk or close to your table that is available for public use. If you still can’t find it, ask the staff. I understand coworking space is ideal for networking. You can always start conversations with people around you, but focus on building relationships rather than trying to close a sale right away to get a new customer. The easiest and fastest way to become a known entity is to barter, offering your services in return for something you need from another coworker. This not only gives you free services, but also showcases your expertise to the community of coworkers who can see your product or services functioning and producing results in front of them. For example, if you are a graphic designer, you could create a logo or business cards for another coworker, or even design a poster and gift it to the coworking space. It will create a lot of buzz, and everyone in the community will see it every day. You will be known as the expert graphic designer who made the poster for your coworking space. Any one there who needs similar services will come to you first. Coworking space is best utilized when you use their offerings and services within the time limit set for you based on what you paid for. Don’t cling to your workspace or conference room after the time limit set for you has expired. Use scheduling tools or at least your watch to set an alarm and remind you of the time when you have to leave or extend your stay. Be empathetic about the hard working management and coworking centre staff who have to get the place in shape after you leave the space. One of the constant challenges a coworking space faces is meetings and conferences running longer than intended. You can’t ask people to vacate a meeting room while their meeting is in progress. On the other hand, you have another group who has booked a meeting room, and they must be provided their room on time. We can’t fault you if your meeting exceeds beyond the expected time, but you can make it easier for us by starting the meeting on time. Most meetings that run late are those that don’t start on time. Coworking spaces have shared facilities that you use along with others. You don’t own the space or the facilities and furnishings, and you don’t rent it by the month either. But you are still obligated to use all of it with care and the love you would show towards property that you own or have paid for. Use the cafeteria properly. Printers, scanners and other equipment has to be used in moderation. Keep your own workspace neat and tidy. Follow waste disposal guidelines provided by the management. Most importantly, make sure that the space is just as good for the next person as it was for you. Again, this is a shared space, and whatever you say or do is affecting people around you. Some spaces restrict usage of phones, loud conversations and music / videos in the common space. If so, there will be meeting rooms or telephone booths that can be used for communicating with others in person or by phone. If so, please follow your coworking space’s noise policy. But as a general rule, most coworking spaces in Bangalore, including Evoma, have no such stated policy. It’s just good manners and an unstated community agreement that you don’t speak loudly in the open space. We offer meeting rooms, board rooms, telephone booths and even an outdoor business garden if you want to speak out loud. By the same token, we also help those who want absolute peace and quiet. This includes a quiet zone (library) where we enforce a strict no-noise policy. You can also make use of noise-cancelling headphones, which means you don’t have to worry about whether others are making noise. As an important addendum to the previous point, make sure that you respect others’ privacy. Coworking space is open and we can’t prevent you from hearing what the people around you are saying if they speak loud enough. In fact, it’s a good thing that facilitates networking – you hear something that interests you, you head over and introduce yourself and join the conversation. That’s fine by us too. But if it’s obvious that a coworker wants privacy and doesn’t want to be disturbed, then it’s good etiquette to leave them alone and not focus on what they’re saying or doing. Once again, a coworking space is shared by you with others. Don’t personalise it to an extent where it’s hard to revert back to the way it was. Don’t move furniture around. Don’t scrawl or write on desks and tables, the way you would at home or in your own office. Don’t put stickers and labels and post-its and other stuff that makes it your desk, but will be a hindrance or irritant for others. WiFi is one of the key features you get to use, along with the coworking space, address and a desk. Without Internet, the space wouldn’t be of much use to anyone. We don’t cut you off if you use up a lot of bandwidth, but we do know who is using how much. Bear in mind that if others did the same thing, then you wouldn’t have any WiFi either. Just do what you need to do for work – there’s absolutely no restrictions on that. But you don’t want to be downloading movies and music all day long. One of the benefits of coworking spaces is that you get to use it as a virtual address or business address even when you aren’t there. Evoma offers a virtual office address to our coworkers as both a premium as well as standalone feature. We’ll take your calls, forward your mail, and make you look good and highly professional in front of your clients. All this goes without saying. But we also get a lot of people who call their clients and then are late, or don’t show up all. So we have people – important clients of our coworkers, who are sitting around twiddling their thumbs. We can’t charge them, and they are taking up the space that paying coworkers are waiting for. This is a no-win situation for everyone. 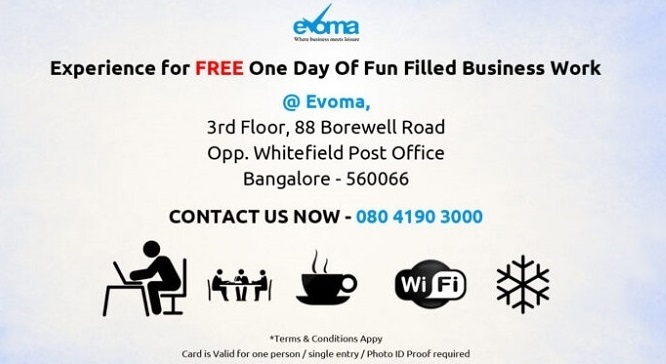 The Evoma coworking space and all our staff is there to help you get more clients and grow your business faster, and at a much lower cost compared to renting full-time office space in Bangalore. All you have to do is understand the boundaries of proper etiquette in your coworking space, and make it a fruitful experience for you, your fellow coworkers, and your hosts.